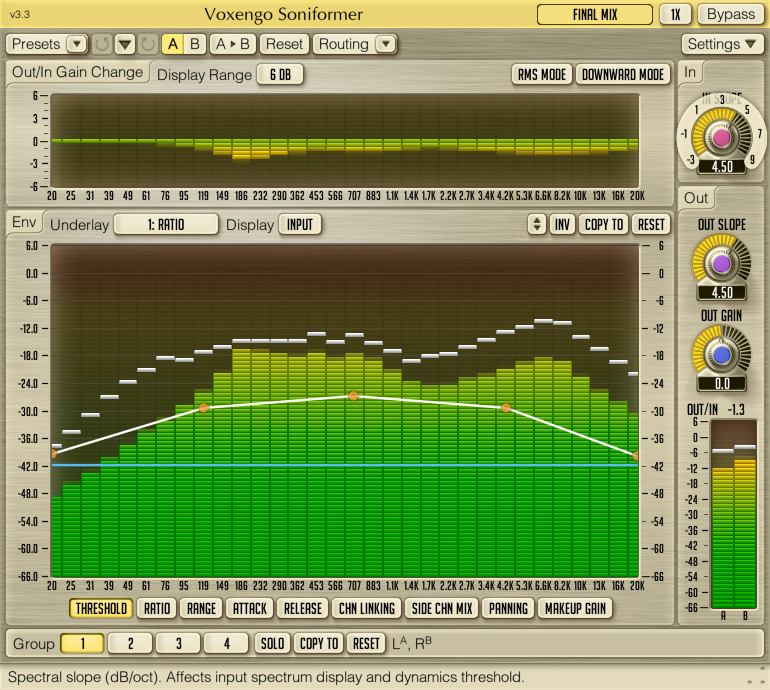 Soniformer is a spectral mastering dynamics processor plug-in for professional music production applications. During its operation, Soniformer splits incoming sound signal into 32 spectral bands. This makes Soniformer a powerful and precise tool for mastering and sound restoration purposes.Spectral mastering dynamics processor. Spectral downward compressor.Spectral stereo panner.Spectral mid-side stereo widener.Mild broadband noise filter. Spectral mastering dynamics processor plugin. ...... of control points. Beside usual threshold, attack, release and compression/expander ratio parameters Soniformer offers you control over "stereo width" and "panning" parameters making Soniformer an effective tool for stereo field adjustments. Not only Soniformer offers you an easy-to-use parameter envelope editing interface, it also features a comprehensive set of spectral metering tools: you can switch between input, output, stereo correlation and stereo balance spectrums. The spectral gain change meter that is always present on the user interface gives you an outline of the overall signal power change applied by the plug-in's processing chain. Qweas is providing links to Voxengo Soniformer 3.3 as a courtesy, and makes no representations regarding Voxengo Soniformer or any other applications or any information related thereto. Any questions, complaints or claims regarding this application Voxengo Soniformer 3.3 must be directed to the appropriate software vendor. You may click the publisher link of Voxengo Soniformer on the top of this page to get more details about the vendor.